Trade up to better franks. Photo courtesy Niman Ranch. Yesterday when we put the dogs on the barbie, they were uncured Fearless Franks from Niman Ranch. Not all hot dogs are created equal. Many supermarket brands are full of fat instead of meat, and make up for the lower-quality meat by over-spicing. Bite into a Fearless Frank and you taste superior quality meat plus a delightful smokiness. The texture is firm and toothsome. The franks are fearless because the meat is free of antibiotics, added hormones and nitrites, and is fully traceable. The all beef franks are naturally cured with a proprietary blend of celery juice and spices. They give peace of mind to those who prefer nitrate-free preparations. Fearless Franks are more expensive, but well worth it. The mantra: Eat better meat; if cost is an issue, eat less meat. You can buy Fearless Franks at Whole Foods Markets and other fine retailers, as well as online from Niman Ranch. Cured meats contain the chemical preservatives sodium nitrite and (or) sodium nitrate. Sodium nitrate is added to preserve and enhance a meat’s flavors and shelf life. When nitrates break down through cooking, digestion or other means, they form nitrites, which are potential carcinogens. 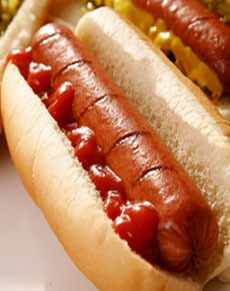 Manufacturers and the USDA claim that the level of nitrates/nitrites is too low to cause problems. But there is enough of a controversy that it makes some people wary of ingesting nitrates and nitrates. They’ve given up hot dogs and other cured meats. 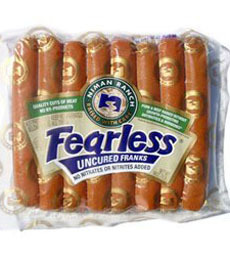 Instead, look for uncured hot dogs, like Fearless Franks. Nitrates and nitrites are chemicals that occur naturally in both all plant foods and some animal products. Both substances are extraordinarily useful to processed meat manufacturers. They provide cured meats with their characteristic flavor and pink color. These chemicals are also very important in food preservation; they’re especially good at inhibiting growth of microorganisms, including those that cause botulism. They’ve been used for these purposes since the late 1800s. The chemical reactions leading to the creation of carcinogens are not subject to speculation, nor are the formations of the carcinogens themselves. Both are well-documented. Although the carcinogens have been demonstrated to cause cancer in laboratory animals, and some research has suggested that individuals with heavy consumption of cured meats have higher risks of colon and pancreatic cancers, no research has shown definitively that they also cause cancer in humans. Uncured franks are made without nitrites. Photo courtesy Niman Ranch. Which is why to many people, nitrates and nitrites are a non-issue. Ancient man preserved meat by cooking it until most of the moisture (which allows bacteria to grow) was removed. The result: jerky. Later, man searched for a less chewy solution, and found it in salt and saltpeter (the natural form of potassium nitrate). During modern times, a product called pink salt, contains a standardized amount of sodium nitrite (it’s not the same product as the gourmet pink Himalayan sea salt) has become the preferred medium for curing and preserving meats. Use of nitrites and nitrates in the production of cured meats is now carefully regulated, with concentration not to exceed 200 parts per million in finished products. Thus, The amount of nitrates and nitrites you ingest when eating cured products is considered to be negligible and, according to the USDA, does not pose any health risk.